In a cautionary tale for all of today’s artisanal food-makers, a small bakery sees its innovative new cookie concept copied by a much larger rival. Losing market share is bad enough but being transformed in the public imagination from original to knockoff may sting even more. If you know the name Hydrox at all, you may think of it as a desperate bid by a rival company to cash in on the broad appeal of America’s favorite cookie, the Oreo. Think again. 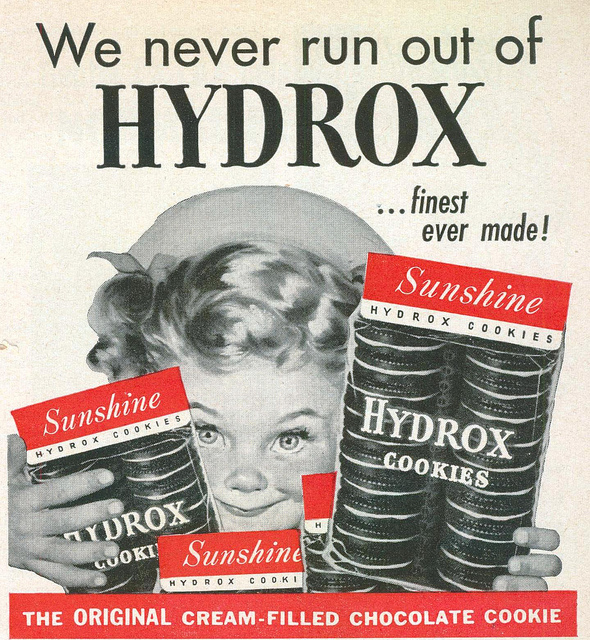 The Hydrox predated the Oreo by several years. Its surging popularity inspired a copycat response from Nabisco, the largest bakery of the era. Oreo is the knockoff. The folks at Nabisco may have felt some pride toward their erstwhile employees but that wouldn’t prevent them from grabbing a share of the spoils. Or all of them. In 1912, Nabisco launched a direct competitor to the Hydrox, mimicking the taste and design so closely that it would take a keen palate and a sharp eye to distinguish them. The origins of the name Oreo are not well known, even in the archives at Nabisco. “Or” is the French word for gold, a color that featured prominently in early packaging, and “oreo” is the Greek word for mountain, which early hill-shaped test versions of the product apparently resembled. One theory says the name has been constructed by sandwiching the “re” from the word “cream” between two “o”s from the word chocolate. Once Nabisco’s marketing and distribution apparatus roared into gear, the larger company simply ran roughshod over the smaller, rapidly claiming the market lead and holding onto it for the next decade. Then the next nine after that. By the end of the century, Oreo was outselling Hydrox by twenty to one. In fact, Oreo so thoroughly displaced Hydrox in the public imagination that Hydrox is generally considered to be the copycat and Oreo the original. Sunshine was gobbled up by Keebler in 1996, which was gobbled up by Kellogg’s in 2001. Kellogg’s stopped selling Hydrox in 2003, by which time the recipe had been reformulated to be sweeter and the name changed to Droxies to appeal to children. A limited run of Hydrox in 2008 celebrating the cookie’s centennial was discontinued months later. Despite fierce loyalty from partisans who claim the Hydrox formula is superior in all the ways that count – in this case 1) taste and 2) fortitude in the face of drowning-by-milk – the cookie appeared to be gone for good. In a heroic brand rescue, however, the rights to the Hydrox trademark were acquired by Leaf Brands in early 2014. They have plans to resuscitate the cookie by the end of the year, though their stated goals are modest. As well they should be. This battle for supremacy is long lost. A niche nostalgia play for the brand’s boomer base is probably the best that can be hoped for. Nabisco is now owned by the global conglomerate Mondelez International, whose PR department can happily boast that Oreo is the most popular cookie in the United States and by some measures the best-selling cookie in the world with over $2 billion in annual sales. In a blind taste test, only the finer palates would be able to distinguish the two cookies. The experts say Hydrox are less sweet and more crispy. (They were also always Kosher while Oreos transitioned to a Kosher recipe in 1997.) But the differences are minimal and, ultimately, were not the deciding factor in this contest. Nabisco’s advertising budget and delivery vans were the difference. This is a case where a competition on the merits – where the market decides what it prefers in conditions approximating a controlled experiment ­– never occurred. In truth, that sort of pure trial rarely happens. The famous “invisible hand” seems always to have its thumb on one or the other side of the scale.